In the last two weeks I continued to focus on the projects. There are documents to read, research to do but at the same time it’s very interesting and it requires creativity, because it is a matter of social projects. Besides this activity I took part to an interesting seminar with the title “How to reduce the disability of your employees?”. 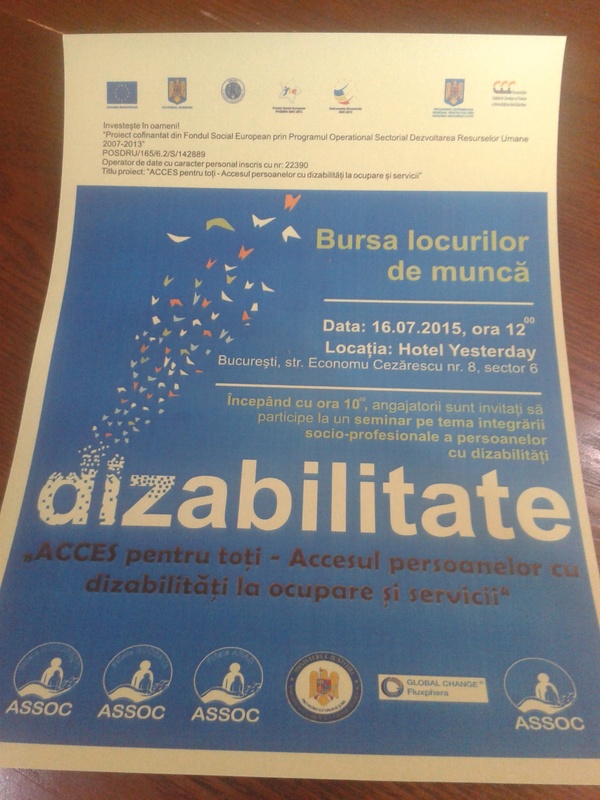 There were invited employers willing to hire people with disabilities. I was there representing Fabrica de mozaic. There were also representatives of ANOFM (the National Agency for Labor) and National Authority for disabled people. After the seminar there was a sort of job fair and I had the opportunity to talk with many people about the possibility to be hired at Fabrica de mozaic. It has been interesting and difficult at the same time. I had the task to answer people’s questions, to describe the working process and the skills required. Around me there were many entrepreneurs with a long experience, for me was the first time but I managed it quite well. I collected contacts and CVs useful for Fabrica. Before this event I took part to a similar event organized by Fundatia dezvoltarea popoarelor because part of the activity of the foundation is based on program to integrate people in the labour market through courses and facilitate the encounter between employers and employees. I was there observing how these kind of events take place.